Last weekend was SQLSaturday Chicago which was good timing I was getting antsy to get to another SQLSaturday since it has been quite awhile since the one in Cleveland. Chicago is one of my staple events. It’s a fantastic one, ran by some wonderful folks and very much in drivable range. 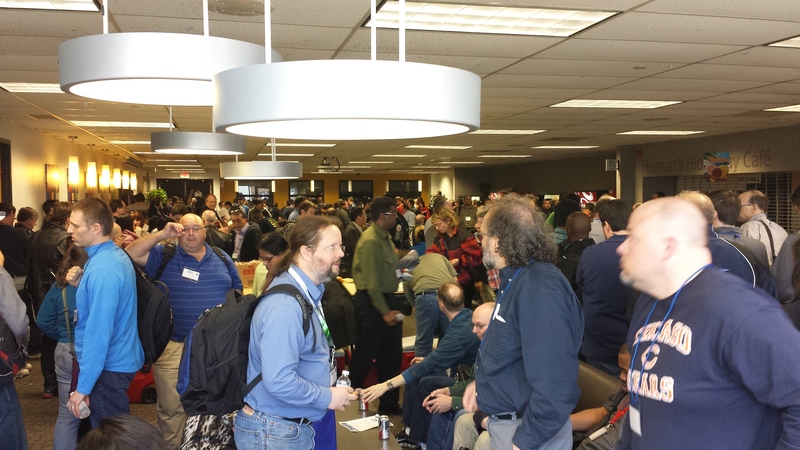 I just looked back and I’ve been going every year since SQLSaturday #67 in 2011! Just amazing that we’re now in the 300s for SQLSaturdays. I head up Friday after getting some work in the morning. I get there in time to get a run through of my presentation. I learned a speaking lesson in Cleveland that even though I’ve given a session several times, never get too comfortable. I didn’t do a run through prior in Cleveland and my timing was off somewhere and I lost 10 minutes. It wasn’t a huge deal to attendees I don’t think but it drove me nuts. I will always do a run through just before an event. It helps the nerves too. 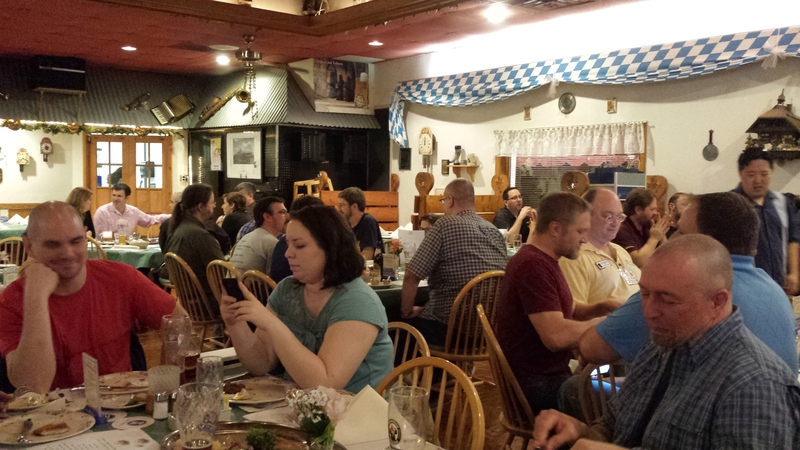 After giving a presentation to the walls of the hotel, head over to the speaker dinner. This was definitely a favorite as far as speaker dinners go. It was at a place called Schnitzel Platz and of course a German restaurant. They brought out a feast of sausages and schnitzel. It was wonderful! 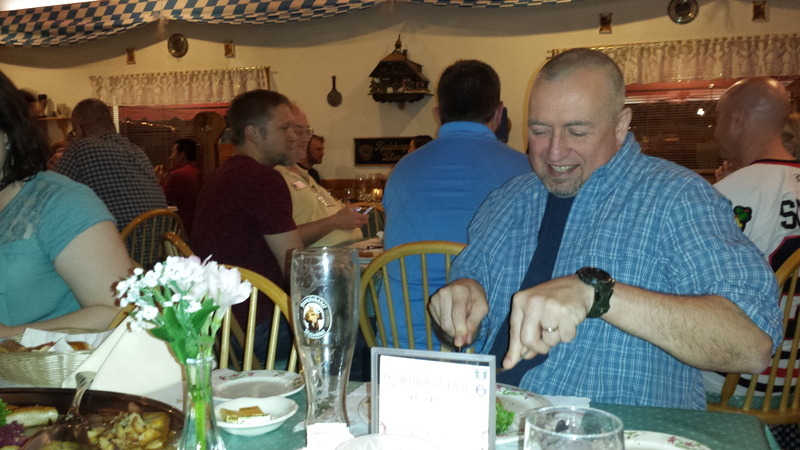 Grant seems to have enjoyed the German food too! Morning starts with breakfast with the lovely Strates, Jason (twitter|blog) & Sarah(twitter|blog) and Warner Chaves (twitter). 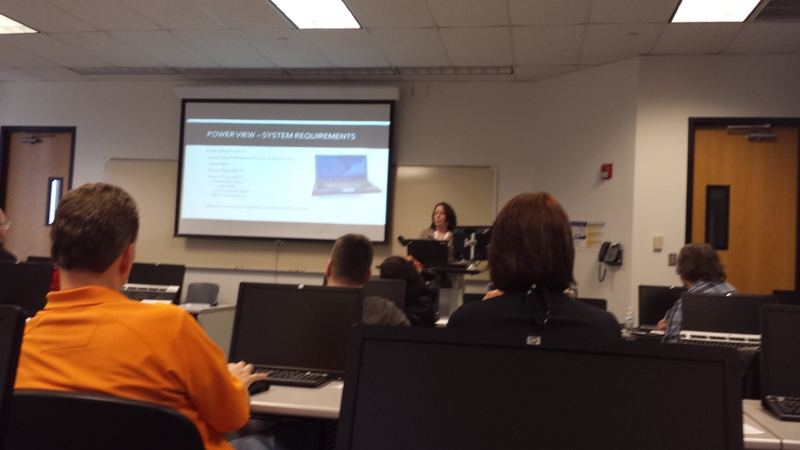 Then headed over to the DeVry campus where the event was being held. My session wasn’t until noon so I had time to get situated and prepare. They were doing an interesting new schedule where they spread lunch over a couple sessions and let those get food as they wish. It seemed to work out for them. The logistics of feeding that many folks are always tricky. My session was over spatial data again and it went really well. I had done some tweaking and with an engaged audience, it may have been my favorite with flow and timing. It also gave me a good story too. 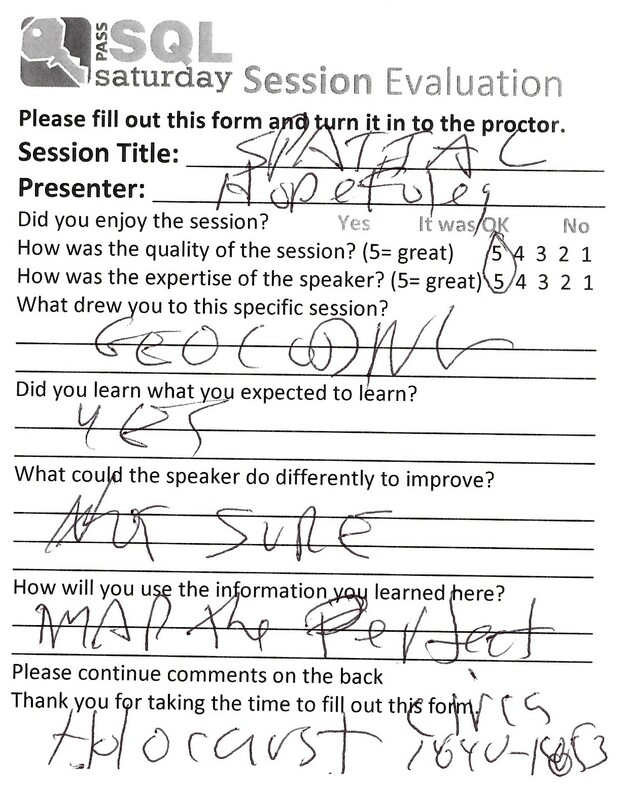 I had a…well an interesting fellow in my session that gave the following creepy feedback. After my session I went to see my friend, Mark Vaillancourt’s (twitter|blog) “Danger: The Art and Science of Presenting”. I had wanted to see it for quite some time but never had the opportunity for one reason or the other. It was very good and not what I expected. I had been expecting a rah rah, you should all present and here’s why session. There was only a tiny bit of that and instead gave a lot of interesting points about speaking as compared to Emotional Intelligence. One thing that struck me was the notion that everyone attending your session is on your side or they wouldn’t be there. It’s often thought of in the reverse and that everyone is out to get you, or “eat you” as he says. Mark has the best sense of humor so his sessions are always entertaining. Mark and his daughter, Paige. Love it when folks bring their kids. Then I had to go see Meagan Longoria’s (twitter|blog) session “Choose Your Geospatial Adventure. I was shocked to see two sessions relating to spatial on the schedule. And even more so that it was by two ladies! Her session was a nice one coupled with mine. I delve into the spatial data type where she covered more the methods to visualize it. It was a good session and showed some examples that I hadn’t seen. It gave me some ideas for some things to try out later. Meagan presenting how to visualize spatial. After the raffle we head back to the hotel for the after party. 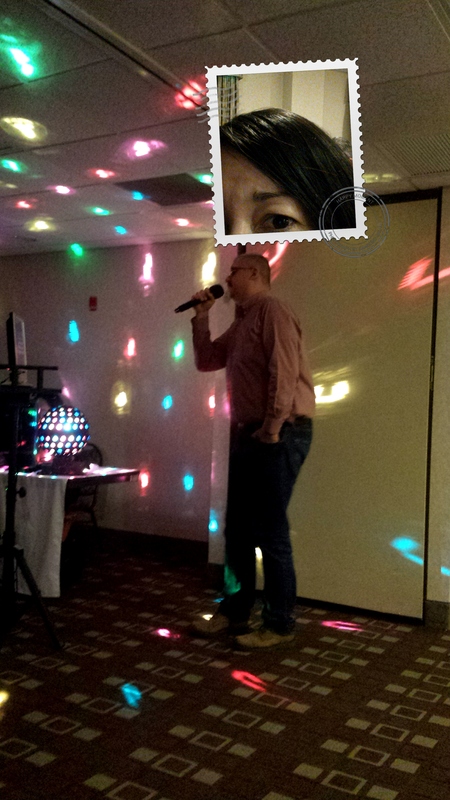 Chicago has a somewhat traditional after party at the hotel with karaoke. It’s nice to not have to worry about driving around. One of the most memorable was Frank Gill’s (twitter|blog) version of “Unbelievable”. He put a surprising death metal spin on it that was shocking/hilarious. Thanks again for another wonderful time Chicago! Organizers you did a fantastic job and really appreciate you allowing me to be a part of it again this year and for the past 3 years! The masses gathering for the end of day raffle. Frank Gill doing best “Unbelievable” rendition ever! And an odd setting on my phone so you see my eye. Who needs to take a pic like that??!! Previous postLet the SQLSaturdays for 2014 Begin! Frank is my new spirit animal. That was one of the best performances ever. 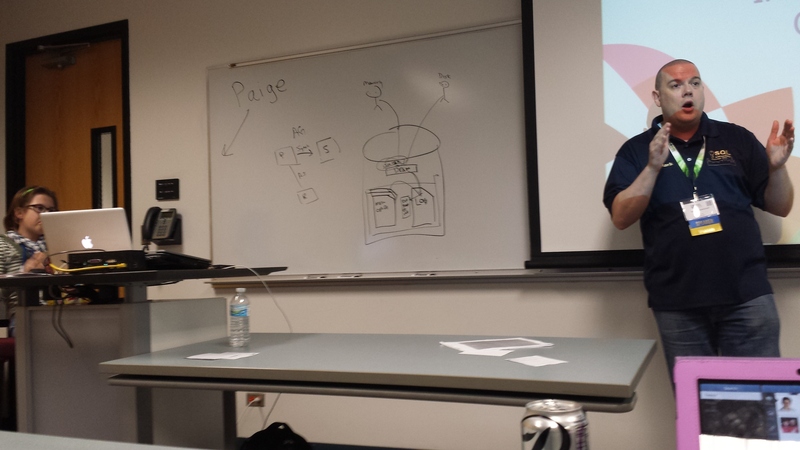 His session on designing a restore strategy was awesome as well. Yay! If you couldn’t tell, the Speaker Dinner was my baby, so I really badly wanted folks to like it. Glad you did!